Coaches should devote time to planning practices ahead of time. The best practices feature a blend of dynamic and purposeful activities that serve to engage and instruct at the same time. During the season, practice time is limited and planning enables coaches to make the most of this time. Post the practice plan in a prominent area in the gym. This is a strong signal to players that the coaches have a specific strategy to help players and the team improve. Also, it makes everyone accountable to make the most of every moment and stick to the schedule. It may also be useful to email the practice plan the night before or post it online in order to prime the team for what is to come. A slogan, representing the team’s culture is written on every page. The phrases “Push each other to get better” and “Pull together” are meant to remind players and coaches of the little things needed to assure success. To remind everyone of the desired workload of the practice, the Rate of Perceived Exertion is listed on the practice (out of 5). This is a guideline to help players and coaches monitor their effort. Afterwards, the coach can check with the players to see if the practice met the target or utilize heart rate monitors. A five-point scale for R.P.E. is easy for athletes of all ages to process. Consider the practice’s place on the Yearly Planning Instrument when designing the practice. Adjust training load (volume and intensity), combine sport-specific techniques and tactics with athletic abilities and make allowances for fatigue and upcoming competitions. Coach individual drills with an eye on the big picture and link each practice drill to the goals for the week and the day. Coaching entails micro and macro planning; the weekly goal and daily emphases ensure that each practice follows the master season plan. When coaches recognize where they want to be after the practice and at the end of the week, they can select the best drills to achieve that objective. To perform at their best, athletes must achieve the right frame of mind. A quote can serve to focus the players and prime them for the work to follow during the practice. It could be related to basketball, leadership, adversity, school or something light-hearted. Make squads and teams ahead of time. Individual practices are perfect settings to experiment with new lineups or create a special challenge for individual players. Players should rarely miss practice, but if there is an important academic or personal conflict, they should notify the coach or manager ahead of time. In order to reduce the risk of an accident, list important safety considerations on the practice plan. Protect yourself by planning thoroughly ahead of time. Stay organized and itemize any special equipment that will be required. Keep the equipment stored in an orderly manner and treat it with respect and the players will do likewise. Give everyone enough time to take care of school and transition to practice. Once the designated time arrives, start the practice, without exceptions. Practice is a special time for the team to be together and on-task. Stick to the planned times and players will take deadlines seriously. Also, it is a sign of organization and reinforces the idea that every moment of practice is valuable. Open the gym early and allow players time to get ready and warm up individually. Warm up activities include: self-massage (with a ball or a foam roller), stretching, skipping, form shooting, pairs passing, stationary dribbling, pre-hap and any other individual needs. A younger team may simply need the time to interact with the coach and put up shots. To focus some of the shooting activities, the coach could give a challenge (for example, make fifty pull-up jumpers before practice). Call the practice to order and explain what will be accomplished during the day and why it is important. Establish a tone that will echo throughout each activity. A thorough warm up includes an activity to raise the heart rate, some preparation for sport-specific movements and activities for the mind and central nervous system. Coaches can be more creative than idle jogging and simple stretching and the warm up is an opportunity to be creative with a fun game. Begin by increasing the athletes’ heart rates by getting them moving around the court, during a sport-specific activity or a low organization game. Dynamic stretching can be led by a player or a manager and should stretch the body from top to bottom. Speed – especially in multiple directions – is a critical athletic ability for modern basketball. The intensity combines the Work:Pause ratio and the target heart rate zone. The Work:Pause ratio is linked to each Energy System and is a guide for coaches to ensure that drills are efficient and players do not stand around too much. Ensure that players are working in accurate game-like conditions by teaching them about how to monitor their heart rates (or use a heart rate monitor). The colour codes remind coaches that it is paramount that players work at the right intensity. Players and coaches have their own ideas about rate of perceived exertion but the percentage of maximum heart rate is objective. List the critical coaching points to be communicated at the start of the drill which will serve as the basis for specific objective non-judgmental feedback. The feedback should be given as the drill is on-going; pull a player aside instead of stopping the entire drill. Coaches should feel free to extend the drill in order to achieve satisfactory execution. The more players know about the science of exercise and themselves, the more effective practices and workouts will be. 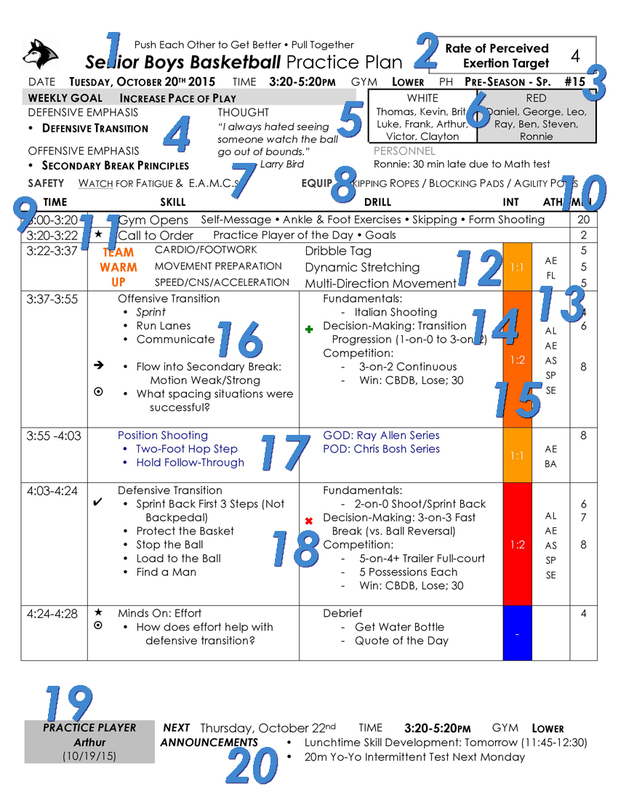 Players are instructed about the benefits of active recovery, which is highlighted in blue on the plan. Instead of stopping practice for a two or three minute break (players may drink from their water bottle on the sidelines at any time), disperse lactic acid and refocus the players with a lower intensity activity. When they are subbed out, players should walk and keep loose or may choose to perform some stretches while watching the action Players should never be sitting or standing still during practice; there is always something to work on. At the start of the practice, the coach announced the goals and objectives for the day. However, everything may not go exactly as planned and some activities may run longer than expected in order to reach acceptable standards of Intensity and Quality. Avoid surprise and anticipate where extra time may be needed; Green ✚ Symbols indicate an important priority that could be extended if necessary. Red ✗ Symbols designate drills that can be curtailed or eliminated if time is short. Reward the player who performed the best during the previous practice. Criteria could be work ethic, success in drills or performances in scrimmages. They could be given a trophy or championship belt and pose for a photo to be posted in the gym or may receive a special privilege or responsibility. Another system that could be used is a Player Reward Board, where stars are given for effort, winning competitions in practice and performance in games. The players with the most stars periodically receive token prizes. Publicize key information and reminders by putting them on the practice plan so they can be addressed in the huddle at the end of the practice. Model strong organizational skills and let the players know what is coming so they can prepare and manage their time. Apps such as Twitter or Remind can help disseminate information for all team members. Responsible players text those who missed practice so that everyone receives all of the announcements. 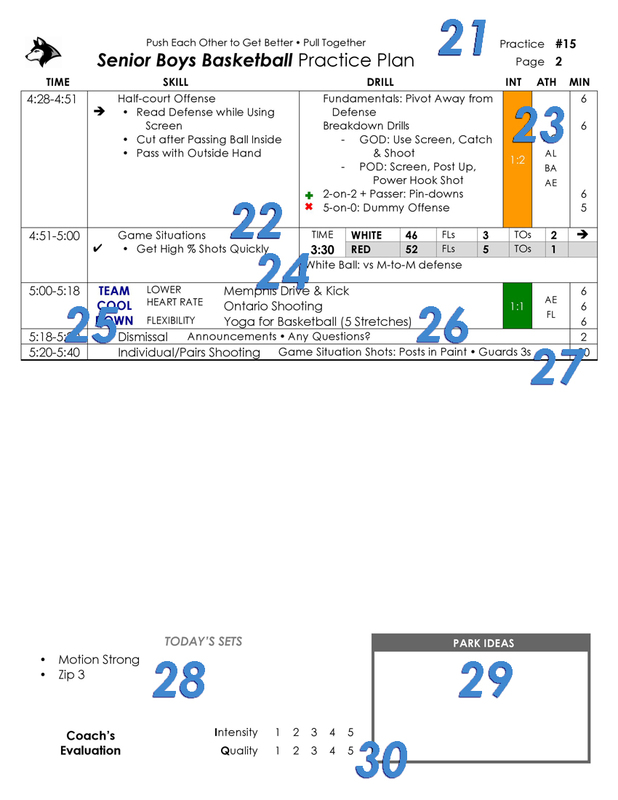 When the practice plan is longer than a single page, use two sided printing so coaches can fold it like a brochure and keep in their pockets so that it is always handy. Arrange drills so that they are progressive, evolving from technical skills to playing with an advantage to competitive 1-on-1 to something that requires reading the court and making a decision. Drills must be loaded so that they become more challenging and demanding. It’s important that drills simulate game conditions so that they are transferrable. For example, some breakdown drills begin with a player passing from a stationary position but in a game, the point guard is pressured as they try to initiate the offense. Therefore, incorporate keeping a dribble alive, protecting the ball and passing under pressure into the drill along with the other skills (such as catching and shooting or reading the defense and attacking). Each segment is broken down into a smaller number of drills designed for specific needs. Always run the clock and keep drills short and to the point. When a manager or coach runs practice, there is an energetic pace and players can focus on each dedicated repetition and give their best. Everything in practice needs to transfer to games. In order to assess how the players’ skills and ability to make decisions on the court, allow them a chance to apply what they have learned in a game situation. It could be one longer game situation or a series of short ones (such as end of game, low shot clock, each team replays the same situation). Coaches could take a less active roll and allow players to think about the game themselves. The game situations could be modified (half/down/back, three positions per team, twelve second shot clock, stop-score-stop) but it is paramount to give informative feedback. During the game situations, players should play hard, play smart and play together. Debrief the players and explain why they succeeded or fell short and how they can improve for the next time. Cool down activities help reset players so that they are ready for the next game or practice. Although cool downs become part of the routine, they can still develop skills and remain competitive, for example shooting drills at a lower rate of intensity than the preceding part of practice. Focusing on form while shooting or technique while running an offense on air teaches players not to cheat on the little details, even when tired. After the heart rate is lower, there are many options to improve flexibility and stimulate recovery. Static stretching or foot and ankle exercises are a possibility but many players have enjoyed yoga for basketball in order to help the core and lower body. Like a game of basketball, when one play is over it’s time to quickly move on to the next one. When practice is concluded, end on a good note and motivate players for their next challenge. Except in cases of extreme extenuating circumstances, never end a practice or workout without stating when the team will reconvene next. All elite shooters either shoot before or after practice on their own. Let the players shoot afterwards so they can work on their own skills. When the players work together in pairs, they build relationships and learn how to give each other respective feedback. The shots should be realistic, based on what the player is doing in the game and not horse play. This is also an excellent opportunity for a coach to work individually with a single player and teach them a skill that they want to acquire, such as a pull up jumper, post play or outside shooting. Follow up with video feedback, perhaps combining their performance with the same move demonstrated by their favourite player. List the sets that will be worked on during the practice. Some practices may fine-tune a small number of options but others will give an overview of multiple plays. It is better to do a few things well than many things poorly. Coaches shouldn’t get distracted if something doesn’t go according to plan or a new idea hits them. Instead of fixating on something unrelated to the practice, coaches write it down and “park it” until a later time. To give the players the best experience, coaches need to be present physically and mentally in practices. At the conclusion of the practice, objectively evaluate what happened. How did the players play? What could the coaches do better? What needs to be followed up next time? Practice Intensity and Quality is a point of emphasis and rating it out of five helps track rate of perceived exertion and fatigue from a coach’s perspective.